William Thrall is the founder of the Thrall family in the United States. William was born in 1605 in Sandridge, Hertfordshire, England and came to the colonies on the Mary and John in the year 1630. He died on 3 August 1679 in Windsor, Connecticut. 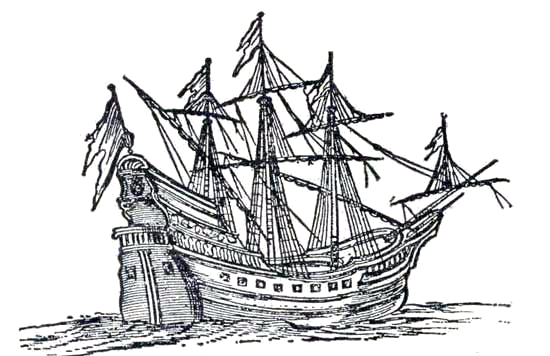 The Mary and John was a vessel of four hundred tons captained by a man named Squeb and the vessel sailed with 180 passengers. William was part of a company of Puritans under the leadership of Rev. John Wareham of Exeter and Rev. John Meverick, both ministers of the Church of England Setting sail from Plymouth, England on 20 March, they first came ashore on 30 May 1630. May 30, Lord's Day. Mr. Wareham and his church, and their goods, were put ashore at Nantasket Point. The went immediately to Charlestown, and from thence to Mattepan, and began a town and named it Dorchester, and the native Indians were kind to them. The danger was imminent, and so complete the victory that it caused universal rejoicing throughout New England, and a grant of land was given each soldier and officer, and to this day the memory of an ancestor who was in the Pequod fight, is an honorable heirloom in every Connecticut family. William Thrall is mentioned many times in the early records. His lot shows up in the first plot of Windsor, between the lots of Nicholas Palmer and Thomas Bascomb, and ran from the road to the Farmington River. In 1646, William sold this lot to Nicholas Palmer and moved to Simon Hoyte's place, north of the village. Robert Wilson bought a half interest with William in the Hoyte's 80 acres, but sold his half to Thrall in 1654. This 80 acres has been part of the holdings of the Thrall family ever since. William Thrall was born in 1605 in Sandridge, Hertfordshire, England, and died on 3 August 1679 in Windsor, Connecticut, America. William Thrall made his will in 1678. I have just found William Thrall and my ancestor through the Hosford family. Let me say that your website is very well done and has been quite helpful. Thank you in advance for this information.